It’s been said that “clothes make the man.” Of course, for many retailers and brands, it would be more accurate to say clothes make the money. 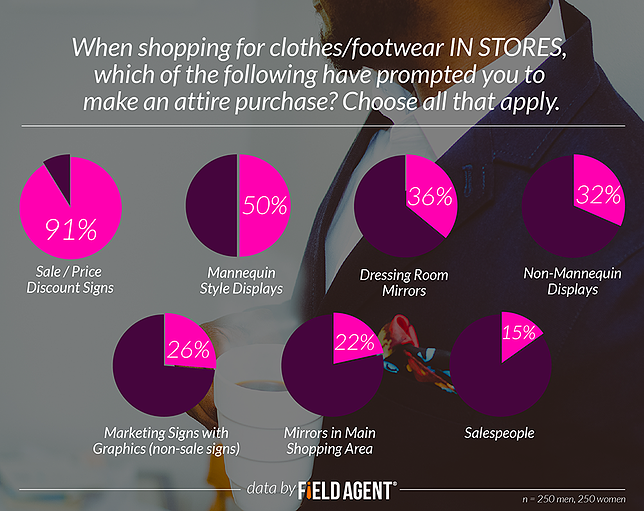 In this article Field Agent presents 4 graphs to help companies get inside the minds of shoppers, to understand what triggers their clothing purchases as well as what matters to them as they shop for attire. According to the Bureau of Labor Statistics, in 2014 the average “consumer unit,” a term encompassing families, singles, and other household configurations, spent $1,786 on apparel and apparel services. Retailers across the spectrum—department stores, mass merchandisers, boutiques, online retailers, consignment shops—compete vigorously for a portion of the apparel dollar. Below are 4 graphs to help clothiers of all types get inside the minds of shoppers. 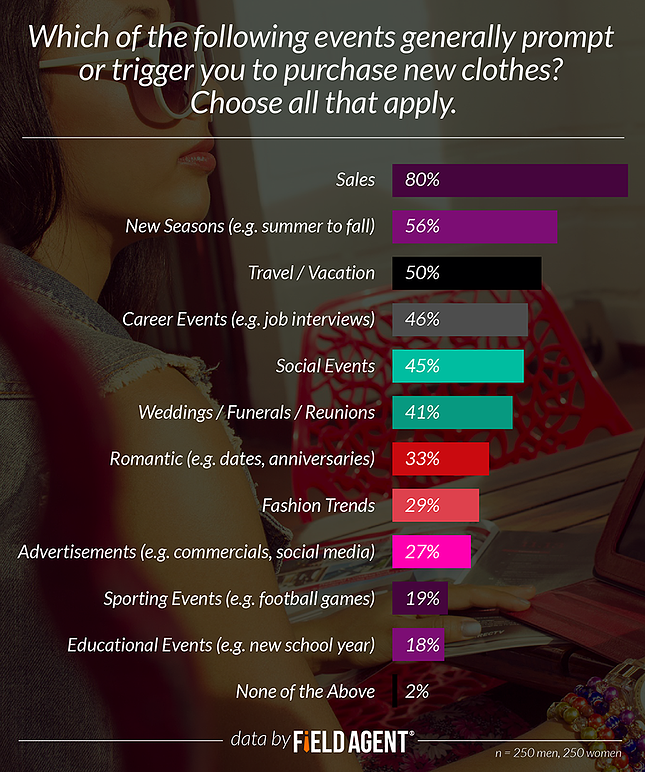 What triggers shoppers to buy clothes, and what matters most to them as they shop? The results were derived from a survey of 500 consumers (split evenly by gender) from across the country. We also draw some interesting comparisons between men and women. What events generally prompt Americans to purchase new clothes? As the first chart plainly shows, nothing prompts Americans to purchase clothes like a discount. In all, 80% of our 500-person sample said the word “SALE” moves them to buy new attire. Men and women felt similarly on this point. In general, however, women proved more open to trigger events than men. By way of example, while 66% of females said a new season will prompt them to buy clothes, only 46% of males reported the same inclination. In fact, for 9 of 11 trigger events presented to respondents, women reported being more likely than men to buy new attire, with the exception of career events (men: 49%; women: 43%) and sporting events (men: 25%; women: 13%). How do Americans stay informed on clothing/footwear styles to purchase? 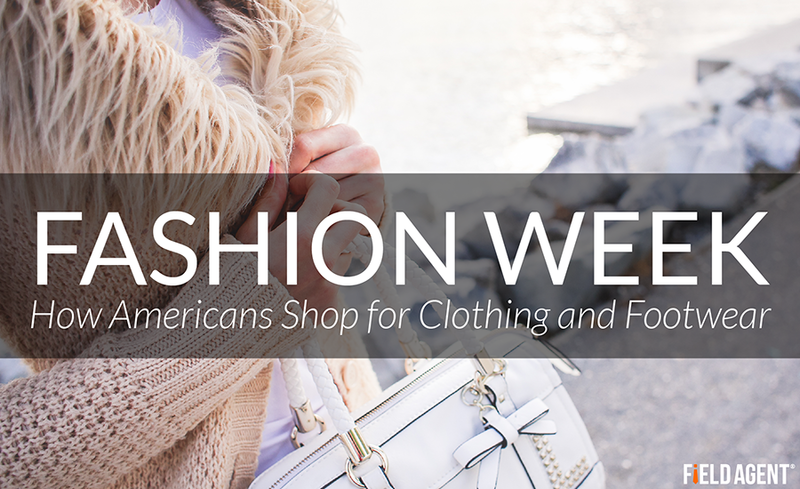 Good enough for first place, 57% of respondents said they look to personal acquaintances, including friends, family, and co-workers, to stay in the know on what clothing and/or footwear styles to purchase. When compared to men (54%), women (60%) were only a little more open to the influence of personal acquaintances. Here, too, women showed themselves receptive to influence from a wider range of sources than men. For instance, 53% of women said they look to social media for information on what clothing/footwear to purchase. Compare this to 39% of men. Additionally, 49% of women, compared to 31% of men, reported that they take cues from magazines/fashion publications on what attire to buy. Men, on the other hand, may be a little more open to influence from athletes (men: 16%; women: 6%) and store personnel (men: 19%; women: 14%). What IN-STORE features trigger shoppers to buy clothes/footwear? Even more so than previous measures, the responses to this question demonstrated the vast importance of price when marketing to shoppers. Altogether, 91% of respondents said they’ve been influenced by a sale or discount sign—while shopping in stores—to purchase attire. No other in-store feature came close, though mannequins (i.e., modeling certain styles) did win favor from exactly half of respondents. Women were especially keen on mannequins as an in-store marketing and selling device. 61% of female respondents, in contrast to 38% of male respondents, indicated they’ve been prompted by a mannequin to buy clothing. And, yes, echoing previous results, women were generally more open to in-store trigger events than men. However, men did say there are slightly more receptive to the influence of salespeople (men: 20%; women: 11%). 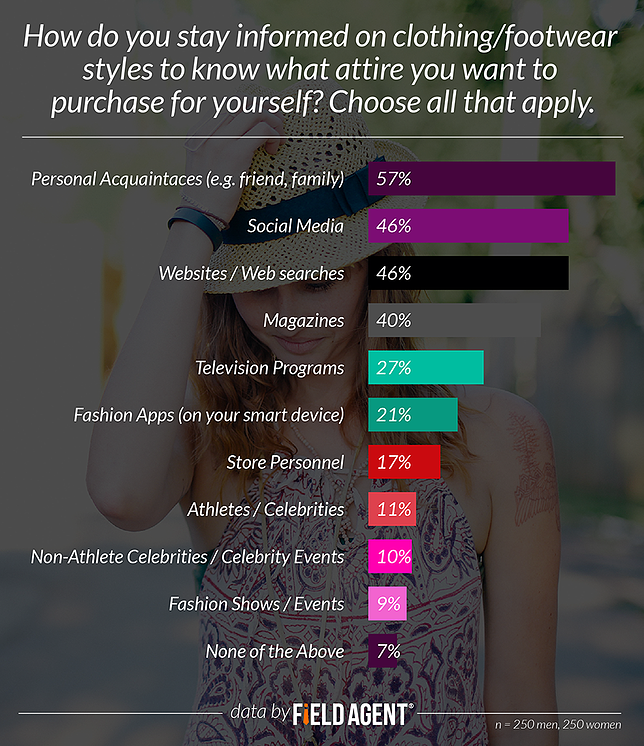 What priorities do Americans have when they’re shopping for clothes? We presented respondents with five potential clothes-shopping priorities, and asked them to rank each on a scale from 1-5, where 1 was most important. You can see from the full results in the chart that a "good fit" is more important than anything—even price. 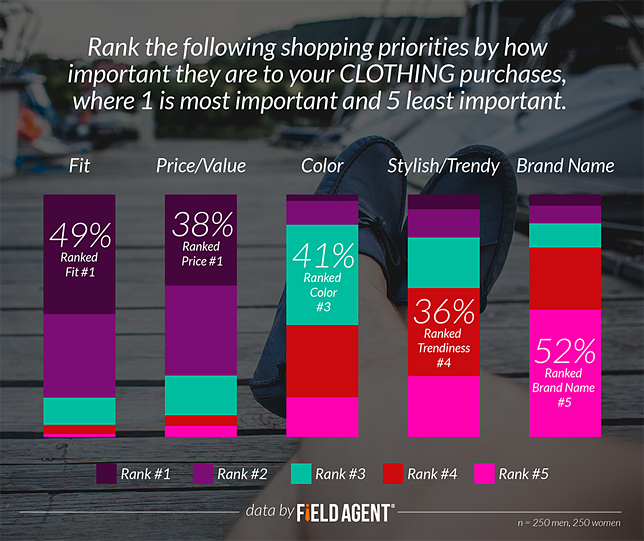 84% cited “fit” as a #1 or #2 priority when shopping for attire. At 75%, price/value came in second in terms of #1 and #2 responses. With respect to the top-level priorities of fit and price/value, men and women were largely in agreement, though, when we account for percentage of #1 and #2 responses, women ranked both factors a little higher than men. Mobile audits and research are never more fashionable than during Q4. With so many critical selling events in the fall and early winter months, companies depend on Field Agent for fast, affordable, and accurate in-store information and consumer insights. From display audits to price checks, mystery shopping to consumer surveys, you can count on Field Agent throughout Q4.